Examples of transfer transactions might be credit card repayments, mortgage and loan repayments, setting aside savings, or moving funds to access them from a different account. This changes the way a category is displayed by removing it from the Earning and Spending chart on your Dashboard, the Digest page, and the Income & Expense statement. It will also remove any budgeted transfer categories from totals on the Budget page summary, as well as the overall figure on the Trends page. All transactions assigned to your transfer category will be marked as transfers and displayed with the transfer icon so they are easy to recognize within your PocketSmith account. 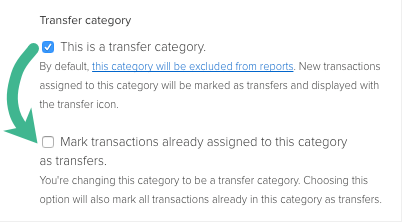 If you change one of your categories that already has transactions assigned to it, to be a transfer category, you'll have the option to treat any existing transactions as transfers too. Learn how to set up a transfer category below. When you have a loan account, the interest transaction out of your loan account represents the expense, not the loan repayment. Assigning loan repayments to a transfer category means that the amount you actually pay off your mortgage (mortgage payment less interest payment) will reduce the loan amount, even though the net worth amount does not change. If you want to show transfers in a different way, please get in touch and we’d be happy to help. You can set up as many transfer categories as you like, but it's best to separate your transfers into categories that make sense to you. For example, if you want to budget for your savings and mortgage repayments, then it's best to have two different transfer categories for these. You can quickly see which of your categories are set up as transfer categories on the Categories page by the transfer icon beside the name. If you have Automatic categorization of transactions from the bank feed turned on, then some of your categories will likely be ones created for you by our bank feed service. We recommend having both accounts that a transfer moves between set up within PocketSmith. When transferring money between accounts, as long as both accounts exist within PocketSmith, two transactions should be imported into PocketSmith - the debit transaction leaving one account, and the credit transaction entering the another. You will need to assign both 'sides' of a transfer transaction to the same transfer category. This applies for both bank feed accounts and manually-updated accounts. Once a transfer category is set up, the category and all its transactions are automatically removed from most areas of PocketSmith reporting. This is useful so that transfers between your accounts aren't counted as income or an expense. In order for transfer transactions to be removed from the pie chart on the Transactions page, head to: Removing transfers from the transactions pie chart. By default, transfers are removed from this page, but you can easily toggle between displaying and hiding transfers on the Income and Expense statement! The overall budgeted figures that are displayed when first landing on Trends page, will exclude transfers. But you can still analyze your transfer categories by selecting them from the left panel. 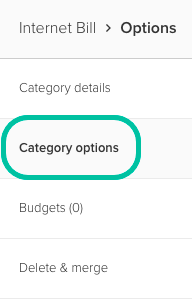 You can change a transfer category back to a regular income or expense category at any time by editing the category and de-selecting the option This is a transfer category. Following this, you'll be given the additional option Unmark transactions already assigned to this category to no longer be transfers. It's important to consider this option because if it is left unchecked, all transactions within the category will still be marked with the transfer icon.